I spent the first semester of my fourth-year in college studying abroad in Bordeaux, France. Within the first couple of weeks, I’d fallen in love with Europe. I wanted to get as much as I could out of the continent before heading home. I told myself I needed to go everywhere. Barcelona, Rome, Athens, Copenhagen, Amsterdam, and Nice were all on my checklist of cities I needed to see. Still, all the flights to where I wanted to go to were much too expensive. I decided to explore my options. I saw that a cheap train ticket and hostel were available for Lourdes. Though I knew very little about the city, I told myself that I wasn’t going to be in France forever and I needed to see all that I could. On a whim, I decided to make the trip. All I knew about Lourdes was that there was a well-known sanctuary in the city. When I came to the city, I learned the full story. In 1858, a peasant girl, Bernadette Soubirous, went to the village grotto to collect some firewood. She claimed that she had a vision of a lady dressed in white. 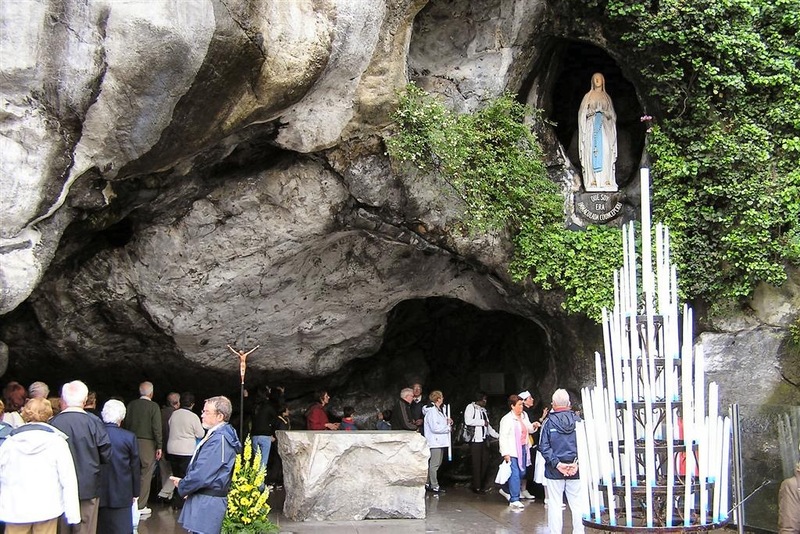 Though initially bewildered by the experience, Bernadette returned to the grotto several more times seeing this mysterious apparition again and again. Eventually, the lady spoke to Bernadette, telling her to drink from the grotto’s spring. Bernadette got down on her knees, digging at the ground with her hands and licking the few drops of muddy water that she could find. Some believed that she had gone insane. A few days later, a roaring spring came from the hole that Bernadette had dug. Some of those who drank from the spring reported that illnesses were almost totally cured. Eventually several churches and statues were built around the area, forming the sanctuary. To this day, ailing pilgrims come from all around the world to try the water and hope that they too can experience this magical healing power. 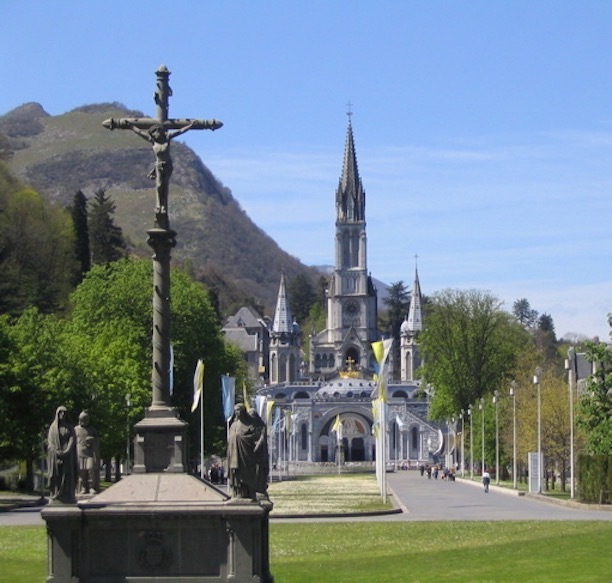 Still, scientists have found that Lourdes water contains no special properties. I don’t consider myself a religious person. When I was a kid, my family and I would go to a Hindu temple about once-a-year. I would sit and listen to some prayers I didn’t understand, wondering when I could go home and get back to playing Runescape on my family computer. These days, I consider myself agnostic. Still, I became enamored with Europe’s cathedrals during my time in Bordeaux. They were more grand and majestic than anything I’d seen in America. Even a nonbeliever like me could appreciate what these cathedrals represented: A belief in something higher than the daily concerns of human beings. I went into the sanctuary excited to see the architecture more than anything. I was not disappointed. The sanctuary was probably the most beautiful building that I had ever seen. I sat at a bench for a bit after arriving, soaking in the beauty in front of me. Does Lourdes Water Really Work? I decided to try some of the supposed miracle water myself. I saw a sign imploring me not to be greedy, that I should only take as much as I needed. I obliged, pouring just a little bit into my water bottle. I took a sip. It tasted a little different than normal water. I can’t say I felt anything miraculous. I sat in the pews set up at the grotto watching pilgrims recite prayers I didn’t understand. I looked around and saw a very diverse group of people engaging in a communal act of worship. To be honest, I’m not sure if I believe Bernadette Soubirous really ever did see an apparition. However, I loved the feeling that I had at the grotto. I felt part of something bigger than me. Maybe it was the feelings of the people around me somehow affecting me. Whatever it was, I’m glad I experienced it. Pilgrims visiting the grotto during the daytime. I continued on past the grotto. There was an area where pilgrims paid a fee to the church and lit a candle. Hundreds of candles burning in unison, representing the hopes and desires of individual pilgrims. I thought about what to do for a second, then I paid the fee and lit a candle for myself. I’m not really sure why I did that. It just somehow seemed appropriate. I’d never heard about Lourdes or Bernadette Soubirous before I came to France. It was still one of the favorite cities I saw in Europe. Though I didn’t experience any miraculous healing, I did leave the city with a new appreciation for how religion could bring people together.